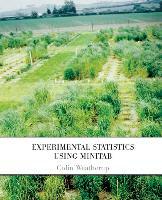 Experimental Statistics using Minitab exploits the availability of the statistical computer package Minitab to explain advanced statistical concepts related to the design and analysis of experiments in an intuitive and easily comprehended manner. This is achieved with a minimum of mathematical knowledge using the data generating and analysing features of Minitab. Detailed instructions for the use of Minitab are given throughout making the book particularly useful for in-class use. Examples are drawn from a wide range of scientific fields. Dr Colin Weatherup formerly held the joint appointment of head of Biometrics Division of the Department of Agriculture for Northern Ireland and head of the Biometrics Department of the Queens University, Belfast. He has taught statistics to students in Agriculture, Biomedicine, Food Technology and in a range of other scientific subjects since 1970. In retirement he is currently an Associate Lecturer in the Open University.